100 years are between these pictures: the wasp waist does still exist! Not retouched, only cut out for transparence. This is the original of the picture on the right (Sylphide). Meanwhile, there is a considerable number of web sites that deal with the topic of corsets in the world wide web. This is a positive development, since there were only very few corset-related web sites some years ago. Most of these sites present many pictures, which is certainly very important, since the first and foremost sensation a corset offers is certainly an optical one. 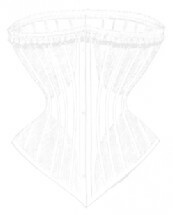 Unfortunately, there are too few texts about corsetry: information, experiences of corset wearers, tips, tricks, historical references and general texts. We try to close this gap with the present web site. We know that this is only a beginning, but it is our aim to present the web's most comprehensive information concerning corsets. We deliberately confine ourselves to publish only text and refer all those who prefer to see pictures to the more "optical" sites that can easily be found in the search engines. So please take this site to be an addition to the existing sites. You are naturally very welcome to put a link on our site. The currently published texts are a good basis. However, it is necessary to permanently add further material, not so much brand new stuff, but rather general information that remains valid. We are open for any cooperation from you. If you have texts which you would like us to publish on our site, please send them to us via e-mail! Critical remarks, suggestions and additions are also welcome. Please help us to offer you top quality! Some people think that the texts presented on this site are partly only for adults who are at least 18 years old. So if you go on reading this site you assure by doing so that you are at least 18 years old. We confine ourselves to "only" texts, but don't think that we don't know the <IMG>-Tag; aside from the background and the navigation buttons we show two pictures on top of the site ;-). The picture on the right shows Sylphide; so you see that she knows what she's talking about when she writes about corsetry! Want to see more pictures of Sylphide? Click on www.sylphide.de. Since the relaunch at 26-Jul-2005 there were 4624609 clicks on the whole website and the actual page was accessed 327319 times.